Ms. Khan receiving the Golden Kite Award. Photo from her website. Rukhsana Khan is originally Pakistani and learned English as a second language. Her prolific writing and huge success has seen BIG RED LOLLIPOP scoop up a string of coveted awards. The book has been voted America’s ‘best picture book’ twice (The Charlotte Zolotow and the Golden Kite) – now, the New York Public Library has named it as one of the ‘100 greatest children’s books’ in the last 100 years. 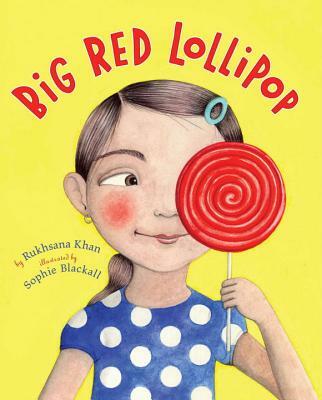 In BIG RED LOLLIPOP, Rubina has been invited to her first birthday party, and her mother, Ami, insists that she bring her little sister along. Rubina is mortified, but she can’t convince Ami that you just don’t bring your younger sister to your friend’s party. So both girls go, and not only does Sana demand to win every game, but after the party she steals Rubina’s prized party favor, a red lollipop. What’s a fed-up big sister to do? Rukhsana Khan’s clever story and Sophie Blackall’s irresistible illustrations make for a powerful combination in this fresh and surprising picture book. Learning English as a second language has been no bar to Rukhsana Khan’s success. Khan arrived in North America as a child from Pakistan and now, her writing career sees her visit over eighty schools a year across North America, make countless presentations and shatter cultural barriers through a string of awards. As the author explains, her book is already beloved by many families around the world. 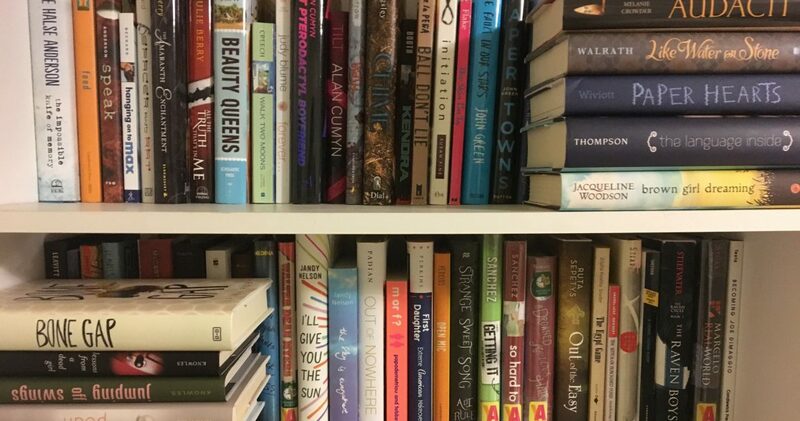 While this particular children’s book has helped Khan further build her name, she frequently tours the world to discuss her other works ranging from gritty teen novels on suicide, Afghanistan and issues of parental abandonment. “It’s not just about writing – but about sharing my work with others and using the stories to open up a series of vital dialogues. I’ve also recently launched a free literary resource for educators as part of my popular YouTube channel,” she adds. 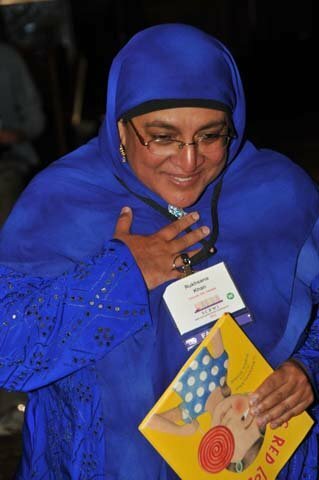 I was lucky to see Rukhsana Khan accept her SCBWI 2011 Golden Kite Award at the New York SCBWI Conference for her book BIG RED LOLLIPOP. I’ve never seen an author as ebullient as Ms. Khan. She told us the true story that inspired the book. Her love and joy were contagious. 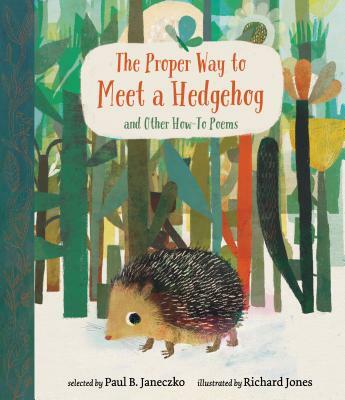 Congratulations to Ms. Khan and the others on the New York Public Library’s Children’s Books 2012: 100 Titles for Reading and Sharing list.